Small Victories. I was first introduced to the work of Julia Turshen when she was the co-author of Gwyneth Paltrow’s first cookbook, My Father’s Daughter (spoiler alert: more on that below). But her solo effort made me an official fan girl. Her recipes in this book are simple, straightforward and filled with comfort-food style favorites that I turn to again and again. The turkey ricotta meatballs are Insta-famous for a reason, the chicken and leeks is delicious and her roasted scallion and chive dip is a crowd pleaser. Every single time. Dinner: A Love Story. This is probably where my love of cookbooks (and my buying habits) started. Jenny’s guide to family dinner – throughout the various phases of her life – reads like a novel and a cookbook all in one and every recipe I have tried has been great. We love the pork chops with apples and onions. We crave the corn bacon hash. And Tony’s steak is a must-try. The underlying message about the importance of family dinner – one that my husband and I both take to heart in our own home – is the best part of the book and makes it an amazing gift idea for anyone, young and old, who values the importance of good food, conversation and connection. My Father’s Daughter. Yes, there is a Gwyneth Paltrow pick on here. But only one. This is her first book and, in my opinion, the most relatable one of the three. The other two are gorgeous to look at, but this is the one I cook from. The blueberry muffins are like a warm hug from your mom. The chicken milanese is a family favorite. The spaghetti con limone is perfect. It’s a simple book filled with cozy favorites and lighter options that doesn’t feel over goop-y or convoluted. Genius Recipes. Food52 is easily one of my favorite foodie destinations on the web and I am happy to share that their non-virtual efforts are just as consistent. This book is filled with 100 “genius” recipes from various chefs, foodies and personalities that are said to change how you cook some of your favorite meals. Marcella Hazan’s famous tomato sauce with butter & onions, Jim Lahey’s prized no-knead bread, Michael Ruhlman’s rosemary-brined fried chicken. These are the (very best) recipes you want to keep with you forever. All in one pretty place. Genius. Foolproof. 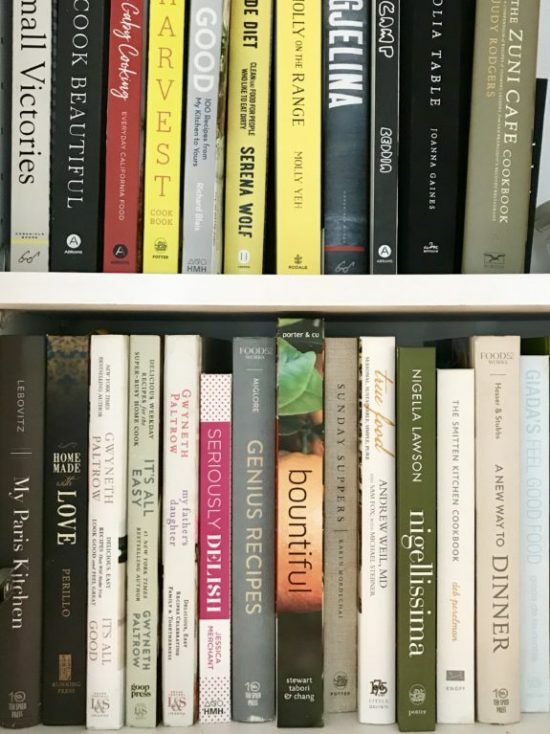 Finally, no cookbook collection is complete without an Ina Garten (or in my case…six of them) favorite in there. And while I consistently find them all a pleasure to cook from, Foolproof is easily the one I pluck from the shelf the most. These are “recipes you can trust” from the queen of home cooking and aside from the odd overly generous shake of salt, they are just that. Delicious, easy (for the most part) and great for dinners big and small. Some of our favorites include the penne alla vecchia bettola, the crispy mustard-roasted chicken and the easy tzatziki. Always amazing. As Ina does. Have any favorites to add to the list? Would love to hear what you’re cooking from these days…so I can add to my Amazon cart!